What Is A Vegan Wallet? Wallets have been around for decades and are incredibly useful for holding all your money, cards, and identification. They also do a range of other things such as protecting your cards from scratches, organizing your money, and more recently blocking unwanted RFID transactions. They’re so common and popular that the chances are you already have one. But no matter if you’re looking for your very first wallet, or you’re thinking about buying a new one, making sure it’s cruelty free is crucial. Currently, millions of animals all over the world are killed for their skin in order to produce a range of disgusting wallets. No thanks to high-end fashion brands, the number of leather, snakeskin, and crocodile wallets have regularly been increasing year on year. It’s only recently that a new range of cruelty free wallets that don’t use any animal materials have become popular. Before we dive into our awesome list of vegan wallets, what exactly makes a wallet vegan compared to traditional wallets? Well, the differences might not be as obvious as they seem. Here’s what you need to know before you start your journey of buying a wallet. Traditionally, most wallets are made out of leather and have been for the past several decades. As you should probably know, leather is dead animal skin, which is usually from cows. As a vegan, carrying dead animal skin around in your pocket is obviously not good, and supporting these companies that make these wallets in the first place is also bad. That’s why if you’re looking to buy a new wallet, there are a few things you need to check to ensure no animals were harmed during the making. The first and most obvious thing to check is what the wallet is made out of. If a company or website just lists the material as leather, then you have to assume it is real leather. However, it is possible to make wallets from fake leather also known as synthetic leather or vegan leather. Wallets made using this material are usually clearly labelled, but if you are ever in doubt be sure to email the manufacturer to get confirmation. But it’s not just synthetic leather that is used to make wallets. There is actually a range of original materials that manufacturers have come up with to produce cruelty free and ethical wallets. Some of these materials include cork, recycled rubber, fabric, Gore-Tex and even duct tape as you will see later on! Another thing to look out for when buying a vegan wallet is the reputation of the manufacturer and brand. Some companies are dedicated to providing cruelty free and ethical goods to their customers, while others only produce these vegan ranges to increase their profits. If possible, it’s always best to support these ethical companies that have committed to only selling vegan products. Not only will you feel great supporting the company, but you’ll also feel confident knowing your money has been spent on buying animal materials. With all that said, let’s take a look at some of the best vegan wallets available on the market today. Traditionally wallets for men are made out of leather from a variety of different animals. However, with the introduction of new technology and materials, real leather is quickly becoming a thing of the past. Here are some of the best vegan wallets for men you can buy that don’t contain any animal leather. If you’re looking for something that looks like a traditional leather wallet but doesn’t use any animal products or materials, then this is the wallet for you. To the untrained eye, the texture and material of this wallet looks just like real leather, but looks can be deceiving! 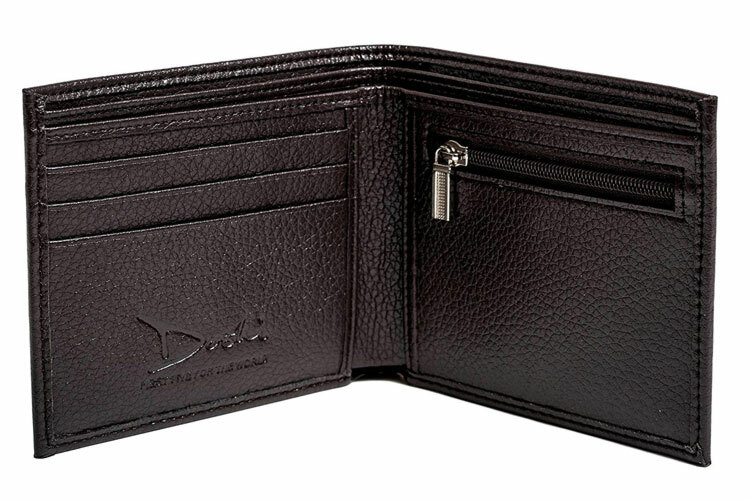 Made from synthetic vegan leather, this wallet by Doshi is incredibly durable and long-lasting thanks to its artificial material. Unlike other wallets on the market, it also has a really nice zip on the coin storage compartment which means it is less likely to undo like a click button. Available in two colors of black and brown, you’ll struggle to tell the difference from a real leather wallet. 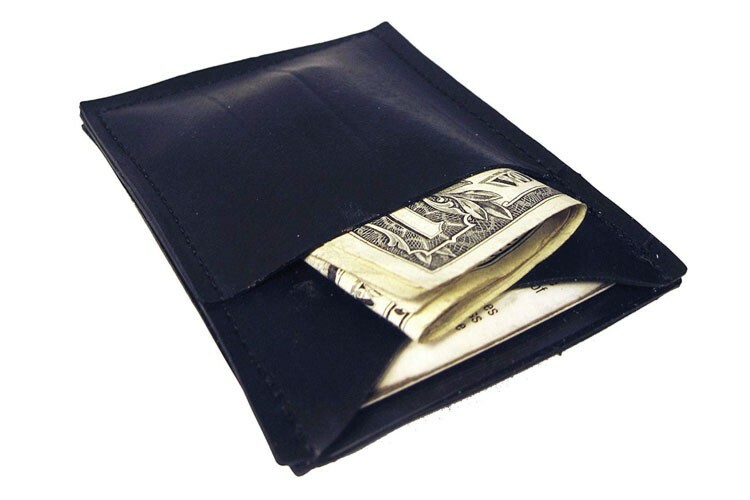 Leather wallets have been around for a very long time, but they are often bulky, expensive, and not to mention cruel. Experience the new breed of wallets with this fantastic slim, minimalist cork wallet by kinzd. Made entirely from the same cork that you find in bottles of wine, this material is extremely lightweight and durable. With the ability to hold six cards, one ID pocket, and various receipts and money, this slim looking wallet will be able to fit in all of your essentials. In addition to the spacious layout, the wallet also includes RFID blocking which stops criminals from stealing information or making contactless payments to your cards. If you’re not happy with this wallet after purchase then don’t worry, each one comes with a 12-month money back guarantee for extra piece of mind. This bifold vegan leather wallet by Corkor is an excellent example of using alternative materials to create durable and long-lasting wallets. 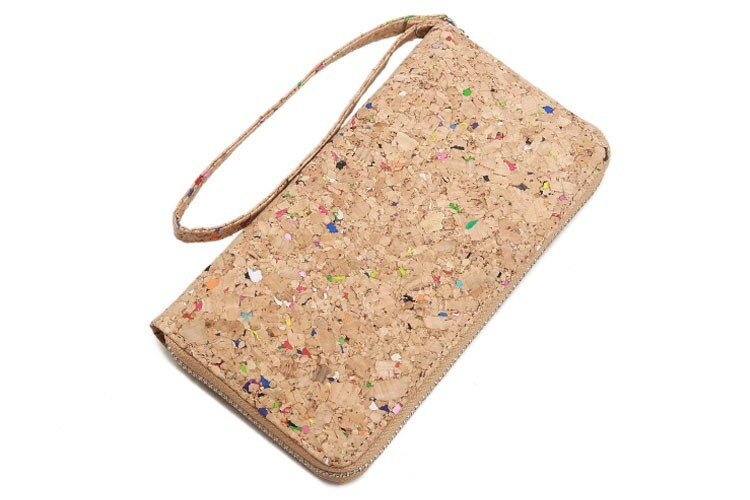 Made entirely from genuine cork, this wallet is 100% vegan approved by various organizations including PETA. This means that you know the product has been rigorously inspected and tested to ensure it contains no animal products at all. 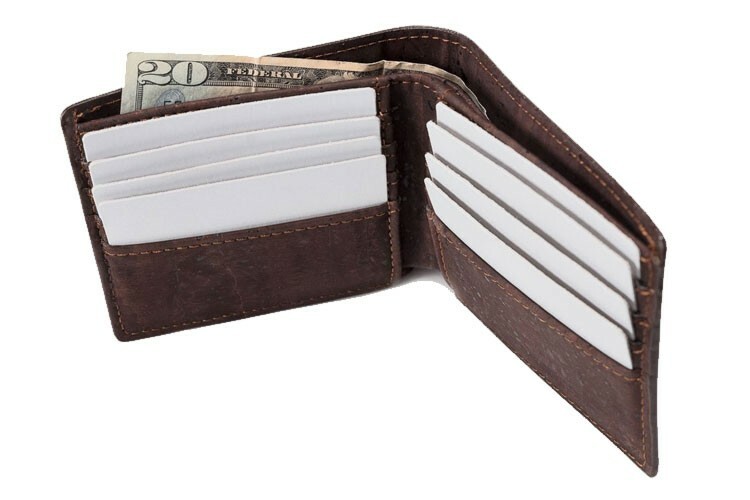 Inside the wallet is one large compartment for notes and bills, six card slots for credit cards or identification, and two slip pockets for storing more notes or coins. Available in six different colors, you can choose from brown and black or embrace the cork leather with brighter beige colors. If you’re looking for something really thin and lightweight to carry your cards around, then this impressive wallet ticks all the boxes. 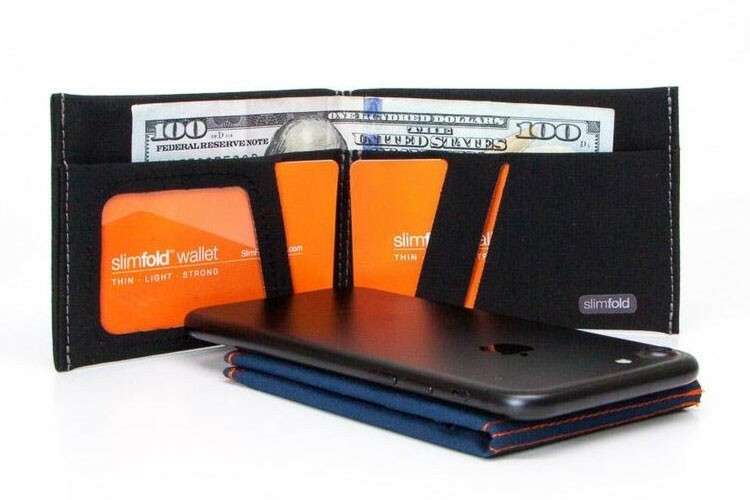 Made in the USA by the people at SlimFold, this wallet is incredibly thin while still having the same capacity and functionality as a traditional wallet. By ditching traditional leather, they’ve managed to engineer a unique material that is described as having the properties of both Kevlar and Gore-Tex. This means that it is more durable than leather while also being waterproof. Perfect for people who are known for leaving or dropping their wallets, you can also wash it in a washing machine if it ever gets dirty. Each wallet comes with a five-year guarantee, but thanks to the durable material, the chances are you’ll never need a replacement. Vegan wallets are not just all about being made from cruelty free materials. This wallet by Alchemy Goods is not only made from a vegan-friendly material, but it’s also environmentally friendly and saving the planet. Made from recycled inner bicycle tubes, this unique wallet is durable, waterproof and extremely lightweight. Perfect for taking on nights out, the wallet features a window ID, a pocket to hold your money, and enough room to fit up to eight cards. If you’re fed up of paying tens of dollars for wallets that seem to break within the first year, then give this one a try. Not only do you help save animals, but you also help save the environment. Now you’re probably thinking this is a joke right? Well, we’re not joking! The chances are at some point in your life you’ve used duct tape to fix something or stick something up. Known for being incredibly tough (and sticky! ), Did you know that dictate can be used for other things too? 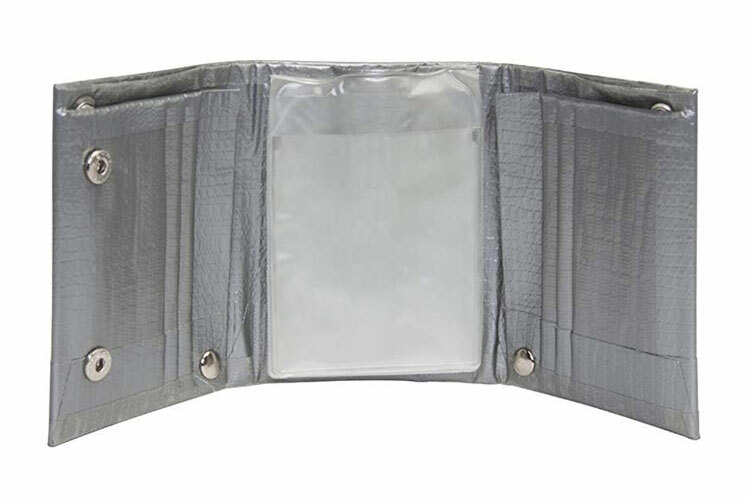 This wallet by Ducti is made completely from duct tape. As strange as it might sound it’s actually pretty ingenious! Available in six different styles and sizes all made from duct tape, you can choose between trifold and bifold designs to suit your needs. As you probably know, duct tape itself is very waterproof and does a fantastic job of keeping things together, and the same is true for this wallet. The market for women’s wallets and purses are regularly flooded with designer brands revealing their latest fur, snakeskin, or crocodile skin creation. Not only do these look horrible, but they also cost lots of animals lives every year. Fight back against the industry and harmful designer brands by switching to these vegan wallets. Whoever said clutch purses have to be made out of real leather or other animal materials? This stylish clutch bag by Lam Gallery proves that cork fabric is just as stylish as leather, without any of the cruelty. With a large internal compartment, the wallet has enough room to fit six cards, plenty of notes, a compartment to hold your coins, and a central compartment big enough to hold your phone. This clutch bag comes in a range of styles including a double zip with splattered paint marks, or single zip with a traditional wood color. 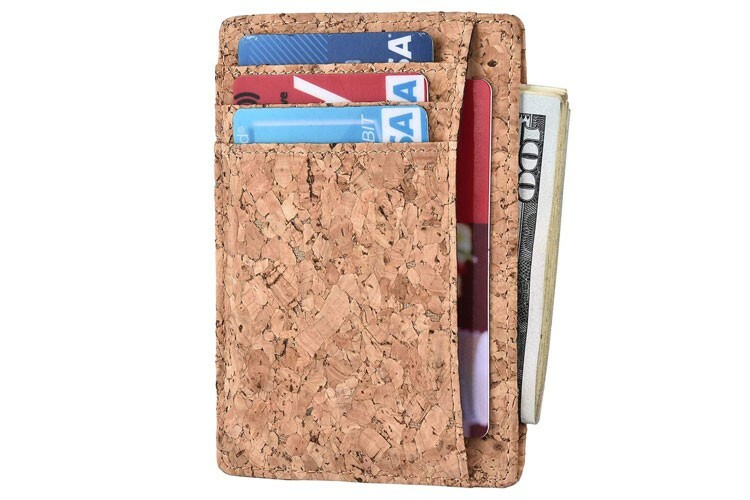 If you’re looking for a clutch wallet to carry all of your cards, money, and coins around with you, then you should definitely consider this cork style wallet by boshiho. With enough room to carry eight cards, plenty of coins, and two mobile phones, this clutch wallet is designed to please even the heaviest travellers. In addition to having lots of compartments, it also has a handy zip enclosure to keep everything secure inside and stop your money from falling out. The exterior might not look like other cork style wallets, but that’s thanks to its creative designers who have managed to create a range of beautiful colors and patterns. Currently, there are four different styles available all following the cork theme but completely unique patterns. If you thought a duct tape wallet was pretty crazy, then wait until you see this. Dubbed the mighty wallet, this little thing is incredibly remarkable. Made from a super strong and durable material called Tyvek, it actually feels like paper when you touch it. But don’t let that fool you. This slim and minimalist style wallet is tear resistant, water resistant, stretchable and eco-friendly. What is even more impressive is the wallet doesn’t contain any stitching at all! It’s made from a type of origami which allows it to keep its shape without requiring any stitching. This means less material used and less to throw away. The wallet itself is bifold and contains two compartments to hold your cards and notes. Considering its basically just a piece of paper, the wallet is incredibly thin and has received plenty of rave reviews for its minimalist style. 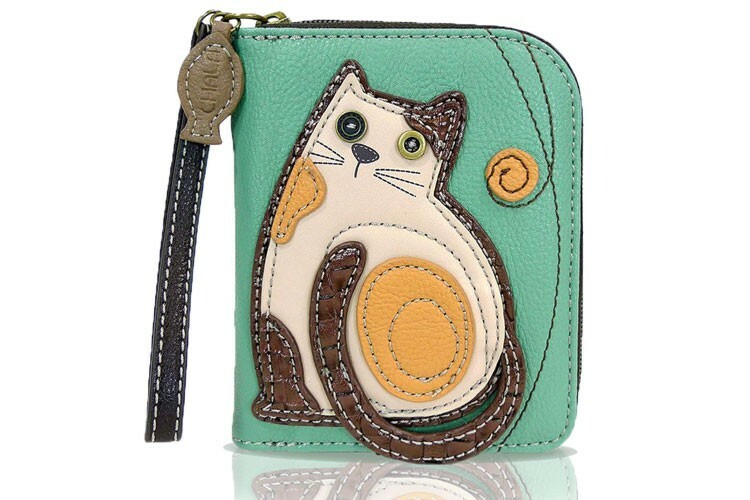 This incredibly cute clutch zip wallet by bungalow 360 is the perfect wallet for any animal lover. 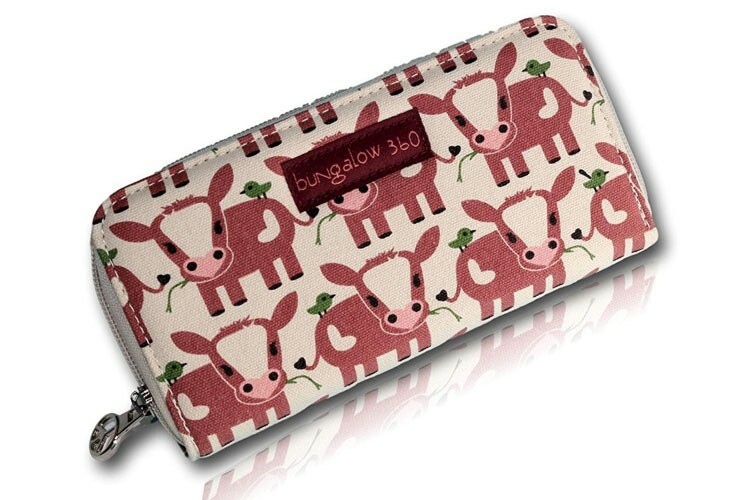 Featuring cute cows on the exterior, every time you get out this wallet you’ll be reminded why you’re a vegan in the first place, to protect those cute animals! Designed in California, this wallet has enough room to store all of your essentials and features several cardholders, two note compartments, and a zip compartment for your coins. 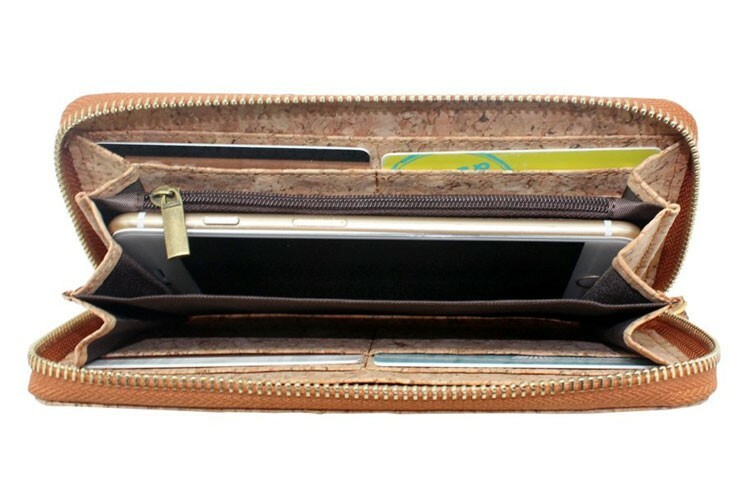 Made from a natural cotton canvas material, the wallet is 100% vegan and include a signature peace sign on the zipper. To make things even better, a portion of sales is donated to animal charities to support their animal causes. With this wallet, you can help protect animals while also spreading the vegan message. Vegan wallets don’t have to be expensive, and you can still get an incredibly functional and stylish wallet without splashing out too much cash. This wallet by B BRENTANO is an excellent example of just that. Made entirely out of faux leather with polyester lining, this dual zip clutch wallet has plenty of inside storage compartments including several cardholders and storage for coins. With so many compartments you’ll easily be able to keep everything organized with the different sections. 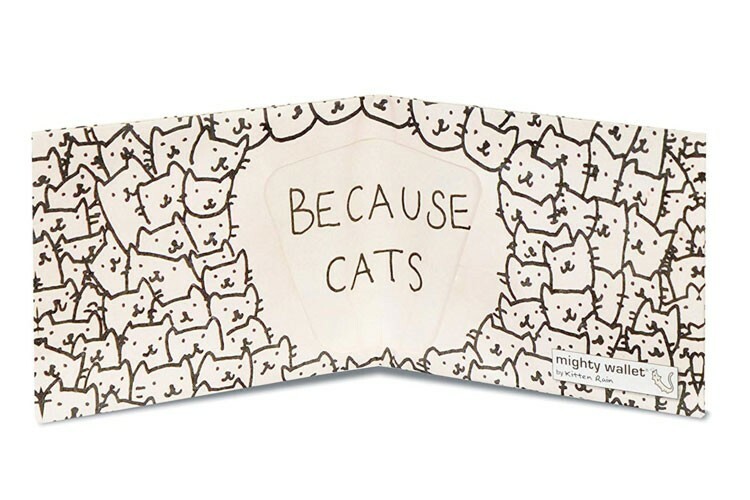 Available in a range of different styles including various cats, dogs, and even unicorns, this clutch wallet is a great fashion accessory for your everyday styles. Sometimes having a big wallet can be very inconvenient due to the sheer size of them. Keep things small and minimal with this awesome miniature vegan leather wallet. Manufactured by CHALA, and made from synthetic leather, this mini wallet comes with eight separate card slots, including an ID window. The wallet itself is incredibly small and compact meaning you can attach it to your trousers or wrist without it getting in the way. Choose from over 15 different animals on the front including cats, turtles, foxes, ladybirds and even llamas! 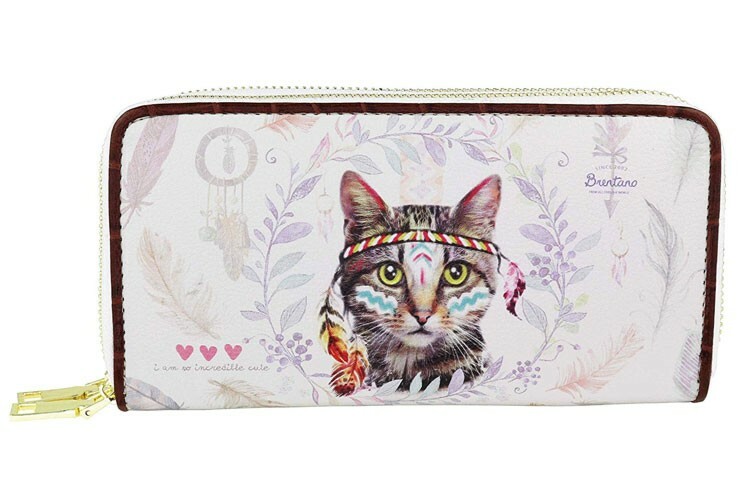 If you’re a big fan of animals and nature, then this is most definitely the wallet for you.